Most of us will far too young to recall those headily optimistic days when everyone envisaged the future as a time of limitless potential, a paradise-in-waiting given form by flying cars, machines doing all the drudgerous tasks that take us away from the doing the things we love, and an enviable trust and belief in the all-but-inevitable upward progress of humanity. Ah, those were the days (or so I hear). Of course now, all that optimism has largely vanished, replaced by talk of zombie apocalypses, environmental degradation and collapse, obliteration by the very machines created to serve us, and an ever-present sense that we are heading for oblivion at breakneck speed. 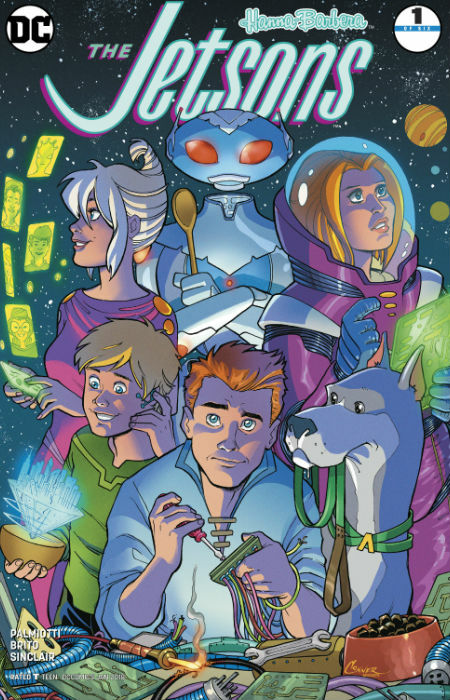 The Jetsons, DC Comics latest comics excursion into the re-imagining of various Hanna-Barbera characters – see The Flintstones, Dastardly & Muttley and Scooby Doo to name but three – has jumped aboard this tectonic shift in the perception of humanity’s fortunes, in the process illustrating just how much things have changed from the 1960s when the original The Jetsons TV series aired and 2017/18 when the new comic books appeared. In an extremely general overall sense, things look much as they always did. Society looks glossy and advanced, buildings and car are suitably airborne and spectacularly-new, and life is made easier by robots and other technological niceties that make life in the future appear to be every bit as bright and hopefully as the retro-futurists foresaw. That is, however, where the similarities end. The new The Jetsons strips back the shiny panels and endless metaphorical sunshine of the future to reveal a world essentially hanging on barely by its collective fingernails. And yes, we’re talking about the entire world, people. 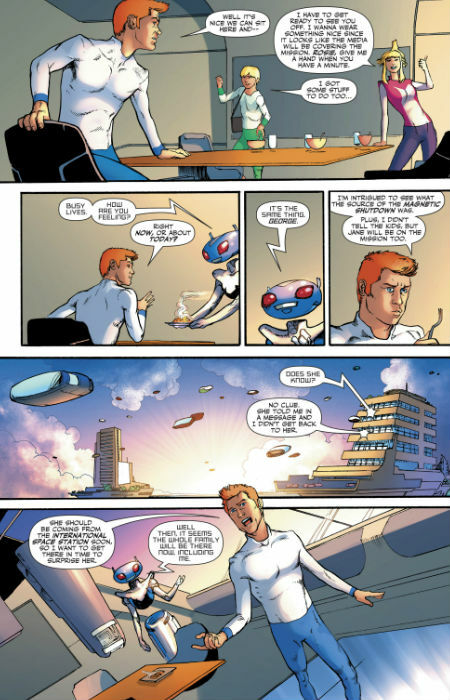 In this brave new future dreamt up by writer Jimmy Palmiotti and artist Pier Brito, Earth has weathered massive damage caused by climate change and a meteor, but barely, with all land sunk beneath the waves long ago. After fleeing into the space stations in orbit, an escape plan which only helped a minority of survivors, leaving millions to perish in a hellish waterworld (no sign of Kevin Costner), humanity has returned planet-side, residing in floating cities adorned by artificial everything- even the trees and grass are the product of synthesised mimicry of the natural world. This sweet nod to Jetsons iterations past is belied by the sage reality of their current life – George is a beleaguered mechanic at Spacely Sprockets, talented and clever but eternally overworked and underappreciated, Judy is a socialite trying to make her mark in the film world, goodhearted Elroy is falling in love with Lake Cogswell and journeying illicitly to Earth’s sunken cities and Jane is a brilliant scientist with the weight of the world on her shoulders. Astro is there, of course, as is Rosie although she is not the Rosie you once knew. This incarnation of The Jetsons‘ tirelessly helpful robotic assistant is in fact the new body of George’s mother who decided that life in a new synthetic body beat the declining rigour of her old biological shell. While she is cheerfully upbeat about her new life, though a little regretful at times such as when she’s straining to remember what water felt like on her skin, and Judy and Elroy accepted her new life with relative equanimity, George is struggling – happy to have his mother around but unsure how to handle the fact that she won’t die and go to be wherever his now-dead father is. It’s a poignant piece of existential storytelling that adds considerable depth to a brilliantly-realised story that examines what happens when the shell of that bright, shiny future is visibly in place, but it is underpinned by so much loss, pain and ongoing threat. A threat which comes in the form of the Jacob Meteor which is hurtling straight towards our blue home, ready to finish off what climate change and the Hanlon Meteor could not. With the clock ticking, and only nine to twelve days to find a way to preserve life as The Jetsons and humanity’s rump knows it, what is present of what’s left of the world is facing oblivion, a reveal that accidentally confronts the family on the day of George’s 40th birthday. Not only is a meteor incoming but Elroy’s journey to one of the sunken buildings to recover a sealed original artwork to give his father for his birthday has released bombs which have fused with the core of the Hanlon Meteor, a ball of unknown metal perpetually rolling around the ocean floors of the Earth, changing it in weird and strange ways that no one quite understands. So not a whole lot of optimism to hand. The cleverness of this new iteration of The Jetsons is that it’s preserved the warmth and love of the family of old, staying true to the warm dynamic that made the animated series such a joy to watch. 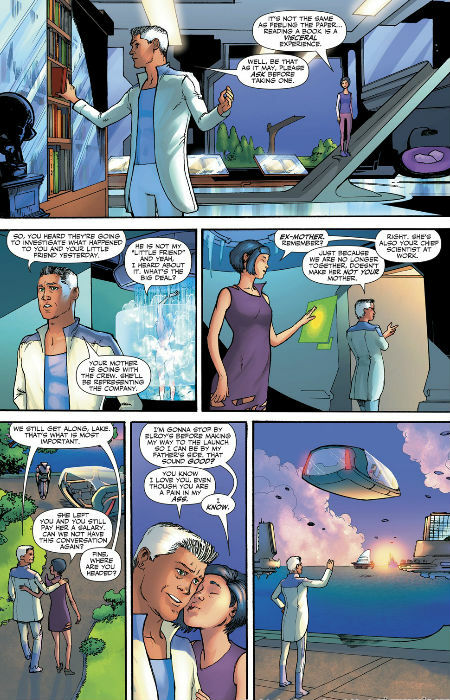 Whatever happened to the family outside of their shiny floating building up in the sky, they were safe and loved within their home and that remains the case in the new comic series. What has changed and changed profoundly – or not possibly; after all, no one really explained why everyone was in floating cities, it was simply a futuristic given – is that the reason for all the floating buildings, cars and robots. It’s not pretty, it’s gritty and dark but it is beautifully and perfectly articulated, the world-building that is both fulsome and thoughtful, delivered elegantly and with insight about where our future perils may lead us in time. As re-imaginings go, it’s breathtakingly good, both hewing close to the spirit and look and fun of the original but enlarging and building on the original premise, adding in some existential angst, some apocalyptic horror and some counting of the costs of modernity, realising in the process a version of The Jetsons that is bright, shiny and appealing but very real, deeply confronting and wholly engrossing.